We just wanted to let you know that the rest of our regular online features have now been updated with issue 7's stories. Competitions - Our Issue 7 Competition winners and your chance to win a personalised photo jigsaw (courtesy of Fabulous Photo Gifts) in our great online competition every month! Recipe - Award winning Head Chef Gary Malcolm from the Fox & Hounds, Coxbench, shows us Grilled Sea Bass Fillets with a Crab and Potato Salad served with a Dill Butter Sauce and Mussels. 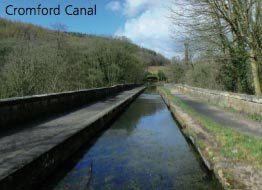 Cromford Canal & High Peak Trail - a walk supplied by Angela Clarke of Belper - www.peakwalker.net. Our new regular walk feature which we hope many of you get to try and enjoy. A walk that explores parts of Derbyshire's industrial heritage whlst also giving stunning and wide-ranging views that include Crich Stand, Carsington Reservoir and the Derwent Valley. To read the full article and for full route details, please click here to view page 36 (.pdf) of Issue 7 of All Things Local. 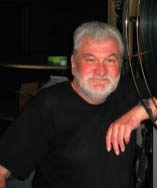 The View from the Projection Box with Ritz Cinema Projectionist Paul Winfield (pictured). Those lazy, hazy, crazy days of summer are with us again, hopefully! We have some great films coming to The Ritz. But first let me make you an offer you can't refuse, because for two performances only we have one of the greatest films ever made, The Godfather, Francis Ford Coppola's epic mafia family saga. If you've only ever seen it on TV or DVD take this chance to see it as the Director intended on our big panavision screen. Filmed on location in Australia, Nims Island is a warm-hearted family comedy set on a magical island ruled by a young girl's imagination - Jodie Foster and Abigail Breslin star. To read the entire article from Issue 7 of All Things Local, click here to view page 69 in pdf format. There'll be more from Paul next issue. A little later than normal, we've started to make available online the updated features and columns from our special 1st anniversary edition of All Things Local. Upbeat - our regular column from our Community Policeman. Word on Wine - our regular wine review - this time - Champagne! We'll also be re-homing our popular RSS feed over to Feedburner so that our regular subscribers can keep up with all the updates in one simple service. If you'd like to subscribe to our RSS feed and keep up to date, then please click on the link at the top of this page and subscribe now. We'll be back with more news, updates and our blog will continue to grow as we add more features and options to the RH info panel. Hi and Welcome to the All Things Local Blog. All Things Local is the Community Magazine for the Kilburn and Belper area (Derbyshire), with 9,000 copies being distributed every two months. Published by local people, featuring news and stories about the local people and businesses. To celebrate our 1st anniversary, we're starting this Blog to include all the stories and features that don't make it onto our website - All Things Local. We'll be building the features and stories over the coming weeks so come back soon. Webmaster - All Things Local.